These few words were sent to me by Rachel’s mother Virginia on 5th February 2003. Rachel was our second daughter – she had problems on the day she was born. She was diagnosed as being a Klippel Trelawny Weber Syndrome baby. This is a very rare blood cell disorder which meant she bled internally into major organs which led to severe anaemia. Rachel died of hydrocephalus in West Suffolk Hospital, Bury St Edmunds. She had spent most of her short life in either Addenbrookes, Great Ormond Street or Bury Hospital. Rachel was the younger sister of Annette. She is greatly loved and missed. These notes were sent to me by Carl’s wife Virginia on 5th February 2003. Carl spent most of his life growing up in Norton and Elmswell. He was the eldest son of Colin and Beryl Finch of Kiln Lane and had two brothers – Larry & Mark and one sister Bridget. He married in 1979 and lived with his wife Virginia in Eastern Way – he worked for his father in the demolition business. His first daughter Annette was born in 1981 and his second daughter Rachel was born in 1983 although sadly she died at 9 months of age. 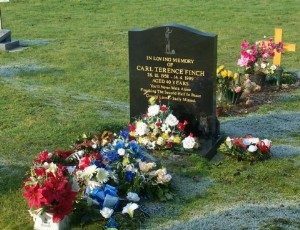 Carl had a great love of sports – football being what he excelled at. 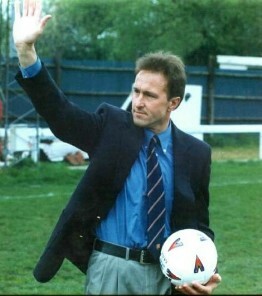 He played for West Suffolk School boys captaining the team from 1972 – 74. He represented Suffolk U-15 level and Suffolk Youths in 1975-76. He then played for Norton Utd and Elmswell in the Bury Saturday and Sunday Leagues before his playing career was cut short by injury. He decided to take up refereeing in 1982-83 and progressed to the Jewson League via the Bury and District League. 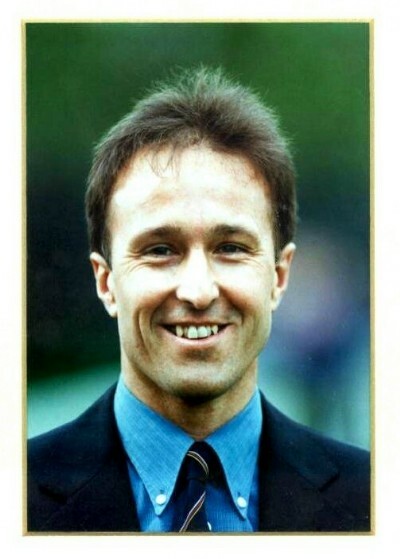 He became a Football League linesman in 1989-90 and a referee on the Panel the following season. 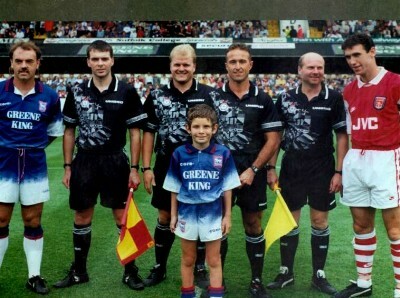 He was promoted to the linesmen’s list of the Premier League in 1995-96 before achieving his ambition of reaching the referees’ list of the Football League in 1996-97. The refereeing family rallied round and amongst other things organized a Football Day on Sunday 19th April 1998 at Ram Meadow in Bury St Edmunds (see report below). This day raised a substantial amount of money for Carl. Players and referees from every level attended the day along with other “celebrities”. The refereeing world sought to remember Carl also and a cup was purchased and inscribed by the Lilleshall Centre of Excellence to be presented to the Fittest First Year Referee on an annual basis at the Referees Conference. At 40 years of age and just after the family had moved to Tostock Carl was diagnosed as having lung cancer. As a non smoker this was very hard to accept. The prognosis was not good, but Carl endured extensive treatment including unlicensed drugs in an attempt to halt the cancer. Unfortunately these treatments were unsuccessful and 18 months after being first ill, Carl died of a stroke in the West Suffolk Hospital on 14th April 1999. He was buried in Elmswell cemetery on St. George’s Day, patriotic chap that he was. Carl is remembered with great fondness by many people in Elmswell and surrounding villages – also in the Football world in general. To date we still hold a Fund Raising day in memory of Carl on the Saturday nearest St George’s Day every year. We have a football match – Referees v. an old Elmswell XI, followed by a dance. All proceeds go to Woolpit Health Centre and we have already bought several pieces of equipment for them. The Carl Finch Benefit Day committee defied the recent terrible weather to stage an event which will he talked about for many months to come by those who attended. It has been many years since so many people have gone through the Ram Meadow turn-stile and the response was a tribute to the popular referee, who is suffering from cancer. However, it was just not the public that made the day, but the response from football’s stars – past and present. Everywhere you looked there was a familiar face. On the pitch the skills of Simon Milton, George Burley and John Wark were admired while on the sidelines, Premiership referee Uriah Rennie walked among the crowd and football professionals graciously obliged a seemingly unending queue of young (and older) autograph hunters. Following the match there was still plenty of fun in hand. First, the raffle, with prizes going hopefully to all the correct numbers and colours. MC Alan Crumpton really must get his eyes tested soon! Then, came the eagerly-awaited auction. Chief auctioneer John Bultitude, Stow FC president, conjoled and encouraged with his individual wit to relax the bidders into parting with their money. Just for the record I jotted down some of the prices paid. Top money was paid for an England shirt signed by Alan Shearer (£310) while a similar shirt signed by the team reached £210. Further three figure sums were paid for a signed Aston Villa shirt (£120 and going to Slew’s John Gillingham), Tottenham shirt (£100), Manchester United signed shirt (£165), Arsenal Ovennars shirt (£200), Jamaican World Cup shirt (£90), West Ham signed shirt (£140), Ipswich Town shirt (£160). Signed footballs also proved popular and sought after. Ipswich Town’s went for £135, a Liverpool signed football was gratefully collected for £105, while a Chelsea football went for £135. The holiday for two on the Orient Express, worth £350, was one of the most keenly-contested lots, with the eventually buyer having to pay out £610.